Your signature Faux Fur accessory. 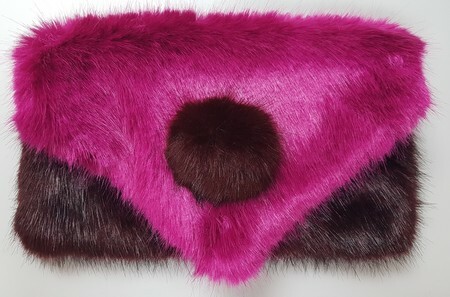 Our stunning Faux Fur Clutch Bags. Add fun and chic style to your wardrobe with our delightful two fur clutch Handbags. Fastened with a hidden magnetic clip, lined in Duchess Satin and measuring 30 cm wide x 20 cm deep (12 x 8 inches) a perfect size for your essentials. The Faux Fur Pom Pom adds a touch of whimsy with a choice of square or triangular flap. Below are a few of our options – The combinations are endless. As all our products are made by hand with loving care in our UK studio we can make any bag with any combination from any of the faux furs we stock. Please call 01255 475 498 or email us at info@fauxthrow.com to discuss your specifications.